Time for a family dinner! • You will have a check on the quantity of food that you have. This will prevent you from over eating or under eating. • The intake of junk food will be reduced by a considerable amount. • You can have conversations about your day with your family and hear about theirs. This will reduce your stress and increase bonding with your family. • Kids are known to benefit most from family dinners. It has been found that children who have dinner with family perform better in school. • Children who eat with family are known to behave better in social gatherings and handle situations better. 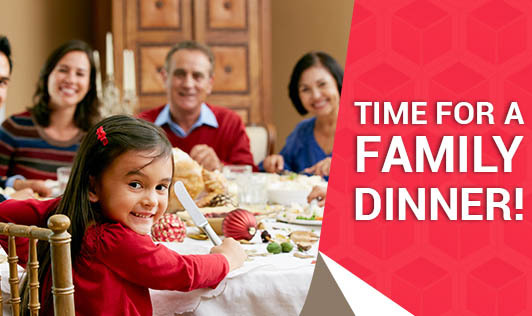 These are just a few of the many benefits that family dinners provide. It is better experienced than read! Like the famous saying goes, "the family that eats together stays together!"